The following addresses were collected from New York City Directories, birth and death records and property records. Mary Ann Dinapoli of Brooklyn was very helpful in compiling this research. This was the family home on Nov. 21,1872 when daughter Theresa married William Sommer. Theresa’s brother Charles, lived here when married in Nov. of 1874 to Elise Ellinger of 344 W.38th Street. Charles and Elise son Charles born here in 1880. Leopold died here Dec. 17,1887. Susanna died here Sept. 14, 1893. Johanna Knoop died at this address on August 5, 1877. She was 25 years old. She was buried in the Leicht family plot but her connection to the family is uncertain. Perhaps, she was the daughter of a cousin of Susanna who married a man named Knoop. (Theresa’s brother) John Leicht, meats, h. 404 West 40th. (NYCD). Not far from 390 Eighth Ave. where the Sommer Family had a business and lived (see below). Leopold Leicht, furniture, h. 404 West 40th. William and Theresa Sommer lived here from 1874-1879. Perhaps, William and John were int he meat business together. Leopold Leicht jr. furniture, h.529 Ninth Ave.
529 9th Avenue Leopold first lived here in 1877. Then Carl (Charles) Leicht and his wife Elsie Ellinger Leicht lived here with their children when their daughter Bella died in 1881, and Elsie died in 1883. 428 West. 43rd Street Caroline Leicht died here in 1904. Leopold jr. died here in 1907. Most of the above properties were owned by the Leicht family. 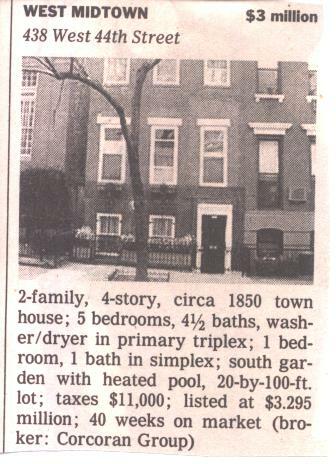 This Residential Sales ad from the March 6, 2003 New York Times, show a townhouse just four blocks north of the Liecht family home at 404 W 40th Street. The townhouse pictured was built at the same time as the Leicht home. To read more about the middle westside at the time that the Leicht family lived here scroll down to the bottom of the page. 390 8th Avenue, Louis and Philip Sommer “eatingh” 1874, NYCD ’74. Apparently, this was a small restaurant owned by the Sommer family? 242 W. 33rd St. (between 6th and 7th Ave) Philip died here Sept. 1874. The New York City Directory lists Regina Sommer, widow, living here in 1874. 700 8th Ave Eliza, the oldest child of Philip and Regina Sommer, and her husband George Moeller here in 1868. George died here in 1868 at 36 years old. He was a chemist born in Germany. (between Lenox and Seventh) Between 1890-1915, this was the home of Elizabeth Moeller Kruger and her husband Charles Kruger. Anna Moeller Eliza’s daughter from her first marriage lived with them. Several of Elizabeth’s children from her first marriage lived nearby. Elise Schmidt, age 7 died here in 1894 (born in 1887). Charles Kruger, Eliza’s husband died Feb. 13, 1900. 1900 Census shows John Schmidt (Eliza’s brother in law, head of the house at this address with Anna Sommer his wife, his father Conrad, children Clara (17) George (9) and Philip (7). Elisa Kruger, Carrie Kruger(15), Lizzie (40) and Anna (37) Moeller are listes as Boarders. Two servants Susi Kunder(19) and Ema Ruhmann (24). 205 West 133rd ST. Feb.17, 1895 George Moeller died here. George was the son of Eliza. 901 8th Ave Louis and his wife Carrie Flammer lived. (1875) This was his wife’s family home and they apparently live there for many years. June 23 1874, female still born. Male child stillborn of Louis and Carrie died here, August 8, 1886. No. 390 8th Ave, Nov 21, 1872 (corner of 30th)when married to Theresa. The same address of Louis and Phillip in the 1872 Directory. This was a small restaurant in 1874. Their first child Susan died here Aug. 9,1874. Their second daughter Theresa died here, Sept 23, 1876. A male child born here, September 12,1877. In 1879, John Leicht, youngest brother of Theresa ran a “meat” business at this address and lived at 404 West 40th. 400 West 36th Street William Sommer while working at the “meat” business at 467 Ninth Ave, lived at this address in 1877. Charlotte was born here December 16, 1880. The property was owned by Elizabeth and/or William Wetmore. It was one block west of the Rochefeller home at 11 W. 53rd Street. It was a residential area of four story sturdy brown stone houses. 243 West 54th Street, (between 7th & 8th Street) Charlotte married in 1904 (at home) to Fred Gretsch by an Evang. Lutheran Pastor. William purchased this property in July of 1903. In 1921, this property was described in a map of Manhattan as a 3 story brick home with basement. It 18.9 feet wide and 50 feet long. This building no long existed in 1996. Theresa had bought the adjacent lot (no.10) the previous year. Theresa died here June 16, 1913. 242 West 33 Street Philip Sommer, father of Anna died here in September,1874. 112 West 53rd St. This was crossed out and 242 West 33rd Street was written in). Her brothers, William and Louis were the witnesses at the wedding. 112 West 53rd Street Anna child July 24, 1881 Regina Schmidt died at this address 11 months 22 days old. 1658 Lexington Ave, (corner of 105th Street) Regina, wife of Philip died here December, 1884. This was the family home of Anna and John Schmidt. Several of their children were born and died here. Anna’s mother apparently came to live with them after the family home on 33rd street was given up. IN the 1880 it would have been considered far out from the city almost country-like. Adele Anna Schmidt born soon after Regina died Jan 5, 1885 (third child of Anna). Adele died here November 24, 1888. (between Lenox and Seventh) The 1900 Census shows Anna’s husband John Schmidt as the head of the house at this address with Anna Sommer his wife, his father Conrad, children Clara (17) George (9) and Philip (7). In the past it was the home of Anna’s sister Elisa Kruger who still lives there with her children Carrie Kruger(15), Lizzie (40) and Anna (37) Moeller. Lizzie and Anna are listed as Boarders. Two servants Susi Kunder (19) and Ema Ruhmann (24) also live at this address. Charles W. Sommer and Brothers, Inc.
“New York City Guide” (Works Progress Administration and Guilds’ Committee for Federal Writers’ Publications, Inc) ed. Lou Goudy. Random House New York. copyright 1939. See pages 144 and following for a description of the “Middle West Side” at the time that Theresa’s father began acquiring property there. “Manhattan’s early railroad and the natural Hudson River water-front facilities played major roles in the development of the Middle West Side. In 1851, when Broadway between Twenty-third and Forty-second Streets was but a winding road through pleasant countryside, the Hudson Rive Railroad was opened to traffic with a station at Thirtieth Street and Eleventh Avenue. A year later, the Eight Avenue Railroad announced opening a line between Fifty-Firth and Chambers Street. O’Connor, Richard. Hell’s Kitchen The Roaring Days of New York’s Wild West Side, J. B. Lippencott Company, Philadelphia and New York, 1958. “on the middle west side between Eight Avenue and the Hudson River. Its Northern and Southern Boundaries are a matter of vigorous dispute but the outermost limits allowed by anyone are from Twenty-third to Fifty-ninth street.